"KAZIRANGA NATIONAL PARK, ASSAM, INDIA"
"LOST HARVEST - THE DEATH OF LOA RIVER"
"INVESTIGATING CLIMATE CHANGE IN ANTARCTICA"
The grasslands of India's Kaziranga National Park host a stunning array of wildlife, from elephants, Asiatic buffalo, king cobras and swamp deer to langurs, leopards and tigers. But this park--now a World Heritage Site--was originally created in 1905 to try to bring back the Indian one-horned rhino, an animal that had been nearly hunted to extinction. Within the park, they've rebounded from just a handful to about 1900‚ but their horn makes them a prime target for poachers. That horn is literally worth its weight in gold on the black market, prized for use in traditional Chinese medicine for purported curative and aphrodisiac powers. This lucrative, illegal trade has put the rhino‚ and Kaziranga‚ in the crosshairs of a war. The same cartels that traffic guns and drugs arm poachers with high-powered weapons, and park guards are armed and have permission to shoot poachers on sight. In general, wildlife in Kaziranga is thriving, but with burgeoning human population encroaching on the park, there is growing human-wildlife conflict. 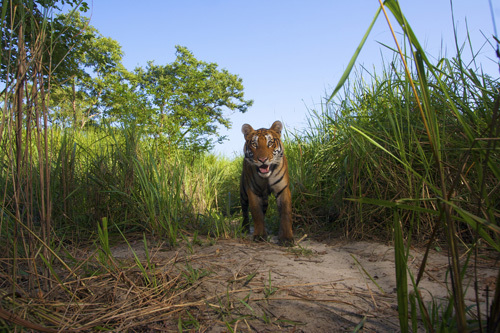 Tigers that wander outside the park's invisible borders kill livestock, elephants trample homes, and along with rhinos, and damage cropfields. People sometimes are killed and wildlife is shot and poisoned. With this story I've tried to capture both the majesty of Kaziranga's wildlife and the reality of trying to protect these animals. It's a complex combination of management and enforcement, and it's no easy task, with big and sometimes dangerous animals sandwiched into a too-small wilderness, surrounded by a growing sea of humanity. Tigers live in perhaps the highest density in Kaziranga National Park of any place in India. In other national parks in India, tigers are in greater peril, but poachers here tend to target the Indian one-horned rhinos instead. Here, a young male emerges from the elephant grass.